Julian Anderson continued his collaboration with the London Philharmonic Orchestra (LPO) at the Southbank Centre with the world premiere of 'In lieblicher Bläue' a poem for violin and orchestra (14 March 2015). Written for, and performed by, Carolin Widmann 'In lieblicher Bläue' was a thing of beauty and, as usual, the LPO conducted by Vladimir Jurowski was outstanding. Julian Anderson (1967-) has been composing since he was eleven. His talent was nurtured by a list of great names including John Lambert, Alexander Goehr, Tristan Murail, Olivier Messiaen, Per Nørgård, Oliver Knussen and Gyorgy Ligeti. He is now a teacher himself - he was the Head of Composition at the Royal College of Music, then taught at Harvard University, but currently is the Composer in Residence and Professor of Composition at Guildhall School of Music and Drama. He has won numerous awards both for his composition and recordings, and is known for his orchestra and large scale works such as the 2013 opera Thebans. 'In lieblicher Bläue' was based on the poem written by the 18th century poet Friedrich Hölderlin, a text which also inspired Hans Werner Henze's 'Kammermusik 1958'. While it is essentially a concerto for violin and orchestra Anderson described it as an “increasingly lyrical meditation on images gleaned from the Hölderlin poem” with the violin representing the poet and the orchestra a context for the poets thoughts. The violin began alone and offstage (where she had her own conductor), but the orchestra soon started to respond to her notes. We heard a dawn chorus of trills and scales and watery flute highlights that were reminiscent of Debussy - and all before the violin was even on stage. Walking through the orchestra she was all texture with right hand pizzicato. Programmatic picture painting followed with the orchestra tolling bells until the next idea, where the strings had a rocking figure under an eastern tune from Widmann. Rhythmic imitation between the violins and soloist were followed by Widmann playing her violin with a pencil, a barely there sound paired with violin pizzicato and flute circles. The pizzicato rhythms expanded throughout the orchestra in a return to a conversation with the soloist - which became more violent through a crescendo. There was a brief respite as Widmann circled around her solo to harmonics, before the rest of the orchestra crashed in with an organ-like timbre. A legato duet with oboe, then flute, led into a more peaceful section and lighter accompaniment, and eventually into something much more Romantic with lots of vibrato and orchestral interludes. One of these interludes brought back the bells. Then came a darker rumbling with muted brass. Fading out, Widmann had her back to the audience as the music died away into silence. 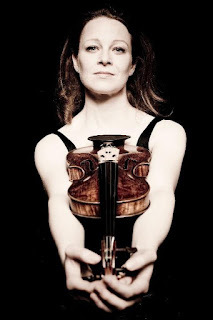 Carolin Widmann is also an award winner - voted violinist of the year 2013 at the International Classical Music Awards and winner of the 2014 Schneider Schott Music Award. Her recordings have also won acclaim, especially her 2012 recording of Schubert and Schumann's works for violin and piano. However she is equally at home with contemporary music including her recording of Morton Feldman's concerto for violin and orchestra. 'In lieblicher Bläue' was paired with the complete score of the ballet 'Daphnis and Chloé' by Maurice Ravel (1875-1937) - for which the orchestra was joined by the London Philharmonic Choir. The different section of the ballet were noted on surtitles, and, like the Anderson, parts of the choir were placed off stage with their own conductor. Even more programmatic than the Anderson, the LPO brought this delightful ballet to life and each little nymph and character was easily discernable even in the absence of dancers. The LPO continues with its series of premieres through 2015-16 - later this year there will be premieres of commissioned works including Composer in Residence Magnus Lindberg's 'Violin Concerto No. 2', Alexander Raskatov's 'Green Mass', Krzysztof Penderecki's 'Harp Concerto' (conducted by the composer) and Marc-André Dalbavie's new work for the baritone Matthias Goerne.